The Texas House and Senate tentatively passed each other’s priority school finance bills Monday, preparing to discuss potential compromises with two days left in the special session. After days of staring each other down over whether and how to improve the way the state funds its public schools, the Texas House and Senate both blinked Monday, with each passing the other's priority school finance bill. With two days left in the 30-day special legislative session that began July 18, the House passed Senate Bill 16 to create a commission to study future school funding reform. The Senate later that night voted 25-6 to pass House Bill 21, which would put $351 million into public schools immediately to help struggling small, rural schools and students with special needs and put $212 million into a health insurance program for retired teachers. Legislators in both chambers portrayed the immediate reform as a “bridge” before the study to provide long-term change for public education funding. The chambers also made some progress on figuring out how to fund education, with the House planning to consider the Senate’s proposal to defer payments to health care companies providing Medicaid. “The House has expressed to the Senate that the House will consider the [health care] deferral if the Senate will do something meaningful to help public education,” said Jason Embry, House Speaker Joe Straus’s spokesman, in a statement Monday evening. Both bills still require final votes before heading back to the originating chamber. The chambers are then expected to appoint legislators to iron out the details of each bill. The House and Senate have been at odds on how best to reform the state’s troubled school finance system. The House wants to put more money into public schools immediately, arguing the issue has been studied to death. Senate Education Committee Chairman Larry Taylor, R-Friendswood, likened the House's plan to driving a broken down car into the ground. Gov. Greg Abbott initially only included establishing a school finance commission in his special session priorities before expanding them to allow lawmakers to consider major reforms. 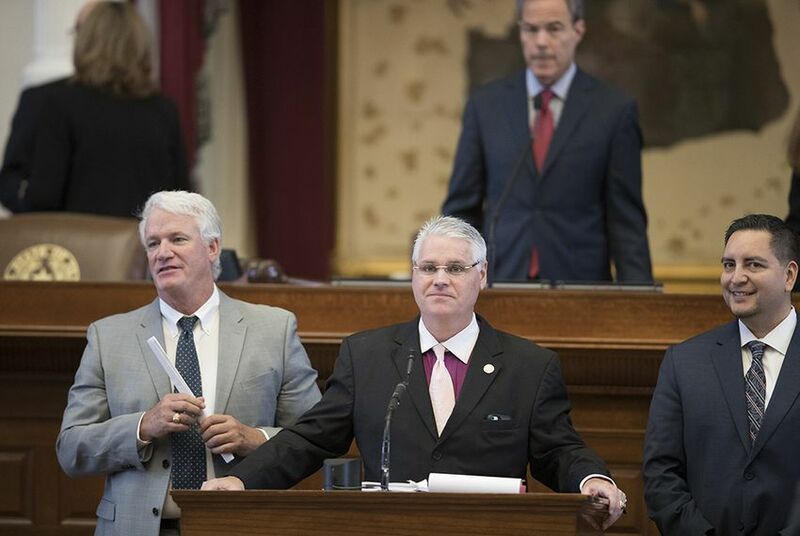 House Public Education Committee Chairman Dan Huberty, R-Houston, called the two bills a “package deal” Monday, saying the House wouldn’t take a final vote on the study unless the Senate passes immediate reform. Taylor made it clear Monday that he didn't know exactly what the compromise versions of these bills would look like. “I wish I could tell you right now I already got a deal, but I don’t,” he said. The Senate passed a version of HB 21 that stripped it of more than $1 billion intended to go into public schools and of the updates to the outdated formulas for directing that funding. The version passed Monday would direct $120 million to charter schools and traditional school districts to pay for new facilities. It also includes a $150 million transitional grant program to help small, rural districts struggling with the loss of a state aid program in September and $41 million to remove an existing financial penalty for small districts. In a letter delivered Thursday, nearly 1,500 local school superintendents and trustees urged Lt. Gov. Dan Patrick to keep the funding and support the bill as passed by the House. Taylor accepted amendments Monday that added $40 million in grants for some public school students with dyslexia and autism and put $212 million into TRS-CARE to make the state-run health insurance program more affordable for retired teachers over the next two years by lowering their deductibles and premiums. The chambers have argued throughout the special session about how to fund fixes to the insurance program. With this pared-down version, many school districts, especially large urban ones, would see no increase in funding. “We will do everything we can to make sure that no school is harmed by this bill,” Taylor said. He also touted the Senate’s proposed study as a necessary step for future reform. “To keep going with the same inefficient system we have on into the future just does not make sense,” he said. Earlier Monday, the lower chamber voted 142-2 to tentatively pass Senate Bill 16, which tasks a 15-member commission of legislators and educators with figuring out how to relieve financial pressure on public schools and better fund the education of certain disadvantaged student groups. The study would create a plan for a long-term redesign of a beleaguered funding system that has been the subject of several court cases. In the meantime, HB 21 would make some immediate, necessary changes, said state Rep. Phil King, R-Weatherford, the House sponsor of SB 16. King accepted several amendments from other House members designed to broaden the commission's scope to study more issues including teacher pay and recruitment, the cost of special education services, and public education revenue sources other than local property taxes. He also accepted an amendment requiring the commission to hold some public meetings outside of Travis County. Fifteen people, including legislators, teachers and board members, would sit on the commission, appointed by the governor, lieutenant governor and House speaker. They would be directed to prepare a report with specific changes by the end of 2018 for the next Legislature to review and act upon in 2019.